It’s finally here—a social media outlet we outdoorsmen and women can truly enjoy. Earlier this year, YUDU Outdoors launched its website followed by a new mobile app on Apr. 28 designed to connect and grow a community of outdoor enthusiasts by providing a superior social media network that supports our freedoms while embracing the core values of faith, family, heritage, respect, innovation and fun. Along with its sharing capabilities, the app features helpful tools including geo-location/GPS tracking features, integrated weather, solunar charts and tables, allowing everything you need on your next outdoor adventure to be rolled into one platform. “Finally there’s a place where you can have your faith, your family and freedom … freedom is about our heritage. That’s who we are, that’s where we come from, and thank God for the NRA to protect that,” said YUDU COO Christopher Merritt. Senn came up with the idea of creating YUDU Outdoors while bowhunting in Kansas in 2015. Experiencing something to which many of us hunters can relate, Senn explained, “Every five minutes my phone would vibrate with a message, and it would usually be asking the same things: What are you seeing? Are they chasing? How is the weather? Send me a picture! 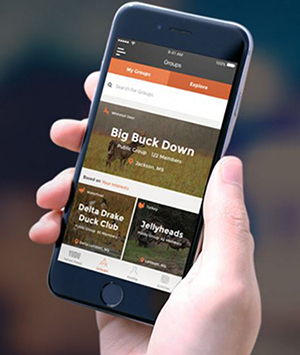 They were wearing me out, and it’s hard to respond with gloves on!” Senn immediately began wishing for an app that would let him share pictures, answer questions and show the weather conditions with all of his hunting buddies. A few months later, Senn captured his 12-year-old son taking his first buck on video and couldn’t wait to share the footage with friends and family—until he remembered how unwelcome hunters’ posts have become on many established social media sites. And so, in an effort to create somewhere to freely share our adventures along with innovative tools helpful to those who enjoy the outdoor lifestyle all in one place, YUDU was born. Join the YUDU Outdoors Community Today! To join the YUDU Outdoors community, visit YUDUOutdoors.com and download the free YUDU Outdoors app, available on both Apple and Android phones and tablets. Welcome to YUDU, What do you do? Editor’s Note: The YUDU Outdoors website and app could not come at a better time as anti-hunters step up their culture war on hunters and increasingly attack and threaten us on social media. As the NRA and NRA Hunters’ Leadership Forum go on offense to save hunting’s future, NRAHLF.ORG will continue to address the ongoing threats to hunting and wildlife conservation worldwide, starting with reporting on how current social media platforms work to quash the content we hunters produce. Visit NRAHLF.org 24/7 for the news and to remain abreast of the issues.